Thanks to Mr. Denis Moynihan of Greenlanes N.S. for sharing his class' artwork. 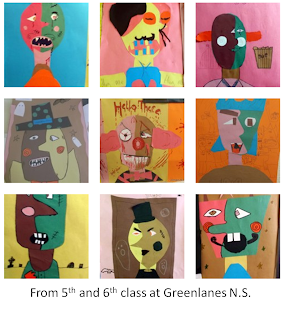 They created these Picasso style monsters following a tutorial by the wonderful Mrs. Picasso (of Mrs. Picasso's Art Room). Some of them have put me ill at ease about going to bed tonight! They're not too difficult to make. I think children of all ages would really like make these and there's tonnes of room for creativity. Mr. Moynihan has been extremely generous and has offered to share his a PowerPoint he made to accompany this lesson. You can download it from here. Click here to view the rest of the blog and pick up some great lesson ideas.